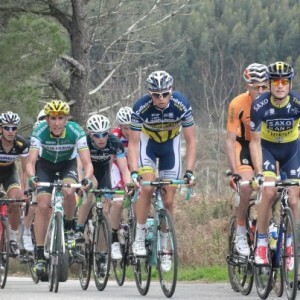 pacing strategy in cycling is important in all scenarios. 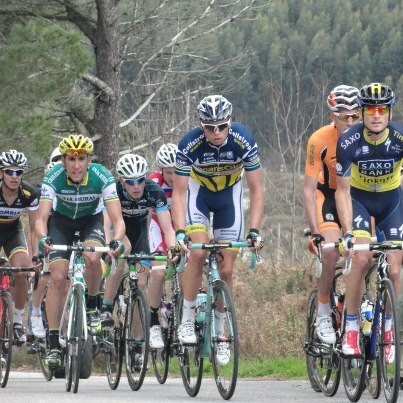 Pacing strategy in cycling is key in nearly all race or ride situations. It’s important in training and it’s important when you’re racing or taking part in a long distance endurance events like ‘La Marmotte’ or L’Etape. You’d think it’s simple: The longer you go, the slower you go. But we know this isn’t the case. To understand pacing, you need to understand the ‘engine’, the terrain and how to get the most from both. This topic can go so deep modern science doesn’t fully understand it. I’m only going to present a very general idea of it. Sprint power (short bursts up to 40”). Unsustainable efforts (up to 12’, burning glycogen exclusively, accumulating acid). High sustainable efforts (up to 1:40 – 2 hours depending, burning a maximal amount of fat and a lot of sugar). Long aerobic efforts (efforts lasting several hours). Sprint power we’re all familiar with. These are short efforts that don’t last longer than a few seconds. The fuel used is the ATP and phosphocreatine at hand in the muscles cells and not replenished. Unsustainable efforts are those where a significant portion of the energy supplied is supplied through anaerobic glycolysis and where lactic acid and other nasties accumulates. Sustainable efforts are those where energy is supplied predominantly through aerobic pathways, just below anaerobic threshold. It’s worth reading about fatmax and some other ideas. Long aerobic efforts. The aerobic component of the engine is the part that fuels recovery and staying power. It gives human beings an incredible aptitude for endurance. At these low work rates, fat contributes greatly to the metabolic mix, but glycogen is still necessary. Generally you’ve got 1:40 – 2 hours of full on effort, like in a time trial or short triathlon. That’s why people bonk in the marathon. And even with good nutrition it’s very hard to escape this limitation. Fig. 1. 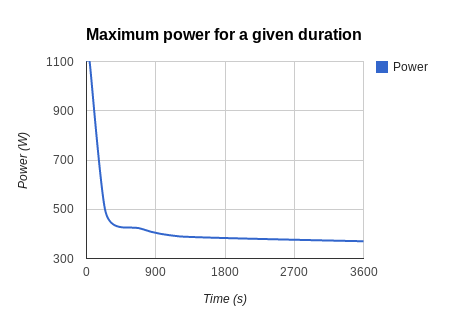 The numbers for power are illustrative, not the shape of the curve. Gravity: Acts with a constant acceleration of -9.81 m٠s-2. Air resistance: Air resistance increases to the cube of speed, so imagine it takes you 40 w to travel at 20 kph, it would take you 320 w to go at 40 kph (eight times as much power). Or say you increase the speed to 30 kph: (30/20)3 = 3.375 * 40w = 135 w.
Friction: I won’t consider friction in this example as it’s the least relevant. When going uphill gravity is the dominant force acting upon the rider. Wind resistance is a significant force, even more so in the real where there are changes of gradient, gusts of wind and flat parts in climbs, or even descents. To get the highest performance on a climb for a given riders power to weight ratio, we need to put more effort in when the climb is at it’s steepest, so your climbing more and fighting through the air less. Fastest rates of ascent are achieved when most of the work is put in against gravity, i.e. on steeper inclines. Climbing in cycling is where races are won. How long is a climb? If a climb is shorter than 12’ then it’s okay to go full tilt, sure it won’t be easy and you’ll be accumulating a lot acid. However if this level of effort is maintained beyond ~12’ your performance will drop drastically as your system becomes overwhelmed by the waste product from anaerobic metabolism. This is why you often see sprinters and heavier riders doing surprisingly well in hilly races, but being nowhere near the front in the high mountains. Think of the Ronde Van Vlaanderen where the race passes very hard, short climbs on cobbles -it’s not the climbers than do well, it’s the heavier riders who can power over these climbs. Hence for efforts beyond 12’ it’s important to keep effort just below maximum -the difference in actual performance is very slight, you might go a couple of percent slower. For situations where there are several consecutive long climbs it’s important to throttle back a bit further again to ensure there’s enough glycogen to get through the entire race or ride. Is the climb at the end of a ride? If a climb is far from the end of a ride, we have to think whether investing all that precious glycogen is worth it, will we have enough glycogen for the rest of the ride? Where there are changes of gradient it’s important to adjust speed to match the effort, so if there’s a flat spot you accelerate, if the hill kicks up suddenly, you slow down. Basically don’t ease off on easy sections. Downhill there is one main force to worry about: Air resistance. Air resistance builds up to the cube of speed so basically the you need a lot more energy to go just a little bit faster. So pedalling down hill hard is a complete waste of energy and you’re better of thinking about technique. Economize your energy going downhill and concentrate on technique. One concern is getting up to ‘terminal velocity’ as quickly as possible so, sprinting out of corners or into steeper sections to reach terminal velocity as quickly as possible will allow you to make the most use of gravity. On flat terrain, like downhill, air resistance is the key factor slowing you down. I’m not going to cover it here, but aerodynamics economy of effort are obviously key. Fig. 2. Very simple, rough diagram of pacing strategy. Sprinting is like free energy. Sprinting when the gradient reduces on a climb, or increases on a descent, out of corners, can help you get to the right velocity very quickly and actually add to the overall average speed. If you overcook the sprint you will start burning up, using your irreplaceable ‘unsustainable’ energy, so keep them short and infrequent. As a rule of thumb it takes at least 90” for your ATP and phosphocreatine reserve in the muscles to recharge and that’s only possible during a sustainable effort. Is there wind on the climb? It’s poor pacing strategy in cycling to slog unduly into the wind where this wind is particularly strong. This energy (unsustainable energy) is better spent where the wind is weakest and the gradient is highest. The higher the gradient, the more work is directly translated against gravity and the quicker you climb, so you’ll have a greater impact if you wait fro when the climb is hardest, to push hardest. However imagine you have a climb with a flat spot in it and you’re climbing at 400 w. When you come to this flat spot you need to accelerate up to 40 odd kph to maintain the same level of effort. These are very slight differences in speed I’m talking about, but it adds up over the course of an event to make a huge impact. This is a fantastic topic to nerd out on and if you’re so inclined there’s a great explanation and interactive online calculator at gribble.org which explains how power is derived on an inclined plane and other fun facts. In terms of the engine, I’ve got an article here which goes a bit deeper.